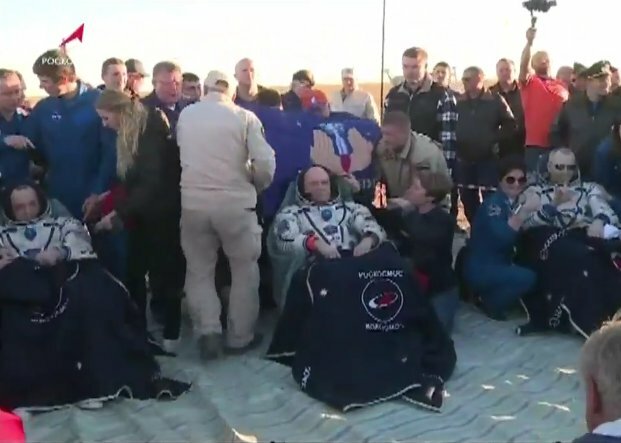 After spending 197 days in space, three members of the International Space Station’s Expedition 56 crew returned to Earth in their Soyuz MS-08 spacecraft, landing in Kazakhstan some 300 miles (500 kilometers) from where they launched in March. Returning home were Russian cosmonaut Oleg Artemyev and NASA astronauts Drew Feustel and Ricky Arnold. The trio undocked from the ISS at 3:57 a.m. EDT (07:57 GMT) Oct. 4, 2018, and performed a fly around of the station before moving away from the complex. A 4-minute deorbit burn was performed at 6:51 a.m. EDT (10:51 GMT) with a parachute assisted touchdown on the Kazakh Steppe taking place at 7:44 a.m. EDT (11:44 GMT). The Soyuz MS-08 crew left behind Russian cosmonaut Sergey Prokopyev, NASA astronaut Serena Aunon-Chancellor and European Space Agency Alexander Gerst to form the first part of Expedition 57. Feustel, who was commander of Expedition 56, handed over command of the space station to Gerst on Oct. 3. This was the second spaceflight for 47-year-old Artemyev. HIs first mission was in 2014 as a member of Expedition 39 and 40 where he spent 167 days in space. His career total is now 364 days. Feustel, 53, was on his third spaceflight and first long-duration stay in space. His first two flights were aboard space shuttle missions STS-125 and 134 in 2009 and 2011 respectively. His total spaceflight time stands at 226 days. Finally, 54-year-old Arnold completed his second spaceflight. His first was aboard space shuttle Discovery in 2009. His cumulative time in space is now at 210 days. For this mission, the trio launched to the ISS atop a Soyuz-FG rocket at 2:44 p.m. EDT (17:44 GMT) March 21, 2018. After a two-day trek, the docked with the Poisk module to join the in-progress Expedition 55 crew. Just a week later, Feustel and Arnold performed their first major task of their flight: U.S. EVA-49, which involved installing wireless communications antennas and replacing a camera system on the port truss. Their busy mission would include two more U.S. segment-based spacewalks. All three were performed by Feustel and Arnold whose cumulative spacewalk times now stand at 61 hours, 48 minutes over nine extravehicular activities and 32 hours, 4 minutes over five outings, respectively. Feustel’s time places him in third place in the list spacewalking experience. He was scheduled to perform one last EVA in September, however, delays in the Kounotori 7 spacecraft’s arrival forced it to be rescheduled for the Expedition 57 crew. 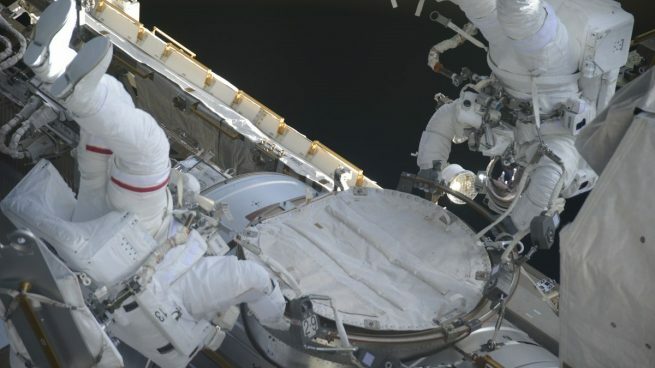 Had Feustel performed the EVA, it is likely he would have surpassed the U.S. cumulative spacewalk record held by retired astronaut Michael Lopez-Alegria who has 67 hours, 40 minutes over 10 outings. Now-retired cosmonaut Anatoly Solovyev holds the world record at 82 hours, 22 minutes over 16 spacewalks. Artemyev, along with Prokopyev, conducted a spacewalk based out of the Russian segment of the ISS. Together, they worked to deploy several small satellites and installed an animal migration monitor experiment. Russian EVA-45 lasted 7 hours, 46 minutes on Aug. 15. It brought Artemyev’s cumulative spacewalking time to 12 hours, 34 minutes (his first spacewalk occurred during Expedition 40 in 2014). The first part of the Soyuz MS-08 crew’s time aboard the ISS was as part of Expedition 55 with Russian cosmonaut Anton Shkaplerov, NASA astronaut Scott Tingle and Japanese astronaut Norishige Kanai. When that trio left in their Soyuz MS-07 spacecraft on June 3, Expedition 56 officially began. Expedition 56 was joined by Prokopyev, Aunon-Chancellor and Gerst when they arrived at the outpost in their Soyuz MS-09 spacecraft on June 8 two days after launching from Kazakhstan. 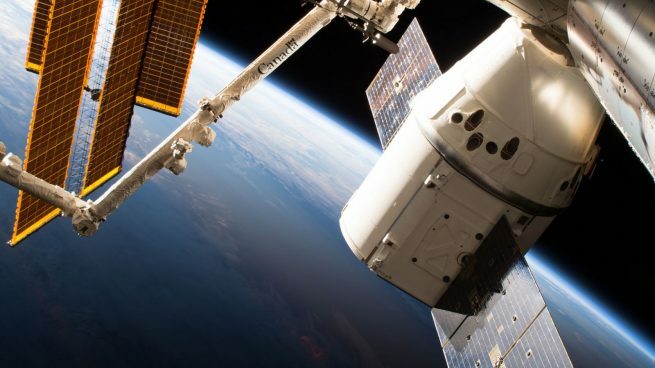 During Expedition 55, two commercial spacecraft visited the ISS—SpaceX’s CRS-14 Dragon in April and then-Orbital ATK’s OA-9 Cygnus in May (Northrop Grumman purchased Orbital ATK in 2018 with the transition occurring June 5). CRS-14 departed in May about four weeks before Cygnus arrived. Another Dragon cargo ship supplied the ISS during Expedition 56—CRS-15. It’s mission lasted about a month and departed in early August. During that time, the OA-9 Cygnus departed the outpost. Also occurring in July was the record-breaking speed run to the ISS via Progress MS-09. It launched from Baikonur Cosmodrome at 5:21 p.m. EDT (21:51 GMT) July 9 and docked with the outpost some 2.5 orbits later at 8:31 p.m. EDT (00:31 GMT July 10). It is hoped that future crews can utilize this rendezvous profile. On Aug. 23, Progress MS-08, which had been attached to the outpost since February, departed and began a week-long free-flight mission for engineering tests. After that, the unpiloted spacecraft was deorbited over the Pacific Ocean. The last major visiting vehicle activity that the Expedition 56 crew oversaw was the arrival and berthing of the the Japan Aerospace Exploration Agency’s Kounotori 7 cargo ship. It brought some 6,200 kilograms of cargo to the outpost, including six lithium-ion batteries that will be installed on the exterior of the station during Expedition 57. Perhaps the most serious issue to occur during Expedition 56 was the detection of a leak aboard the ISS on Aug. 29. After an investigation, it was determined the leak originated from the Orbital Module of the Soyuz MS-09 spacecraft. Ultimately, the 2-millimeter hole was sealed via an epoxy substance. After an initial investigation, the hole was determined to be caused by human hand, likely from someone who worked on the spacecraft on the ground. The investigation is currently ongoing. During Expeditions 55 and 56, some 250 experiments were performed that in areas of physics, biology, life sciences, and more. After Soyuz MS-08 undocked from the Poisk module, Artemyev maneuvered the spacecraft to fly around the 400-metric-ton ISS. This was done to get updated photographs of the whole outpost in advance of the 20th anniversary of the launch of the first elements Zarya and Unity in 1998. Once that was completed, the spacecraft performed a final departure burn to slowly drift away from the outpost. At 5:51 a.m. EDT (10:51 GMT) Oct. 4, some two hours after leaving the vicinity of the ISS, the Soyuz MS-08 performed a deorbit burn lasting 4 minutes, 39 seconds. This slowed the vehicle down by about 420 feet (128 meters) per second, enough to enter the atmosphere to drop out of orbit. About 27 minutes later, before entry interface, the three sections of the Soyuz—the Orbital Module, Descent Module and Service Module—separated. Only the Descent module with the crew is designed to survive re-entry into Earth’s atmosphere. Once Soyuz MS-08 entered the thicker part of the atmosphere at around 62 miles (100 kilometers) in altitude, it was low enough for friction to begin to slow the spacecraft down. At that moment, Soyuz MS-08 was traveling about 5 miles (8 kilometers) per second. The capsule was protected by a heat shield. In just seven minutes, it and the three inside decelerated to just 1.4 miles (2.2 kilometers) per second, causing them to feel a peak of just under four times the force of gravity. 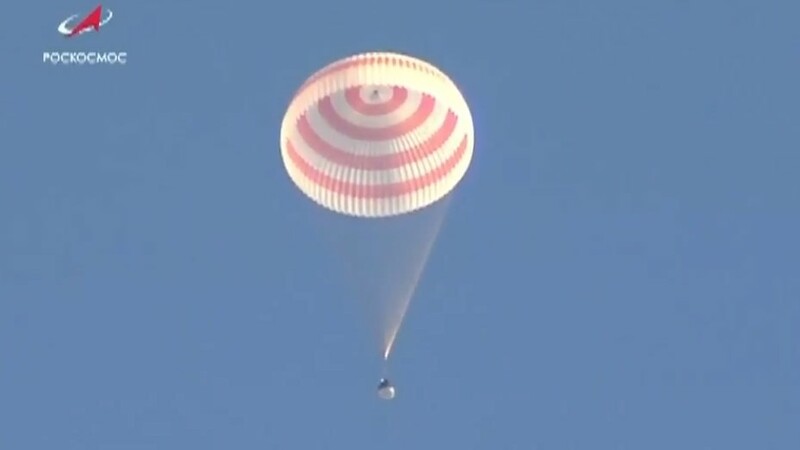 Once Soyuz was slow enough and deep enough in the atmosphere, a series of parachutes began to deploy, culminating with the main parachute for a several-minute slow descent to the ground. During that descent, the crew seats were pushed forward to better absorb the upcoming impact with the ground. Additionally, soft landing jets fired about a meter above the surface to cushion the landing further. Upon touchdown, the capsule landed on its side, which isn’t unusual as the parachute sometimes pulls the vehicle over before it detaches. Once Russian search and rescue teams arrived, the trio were pulled out and carried to nearby chairs for initial health inspections. First was Artemyev. He was followed by Feustel and then Arnold. After initial health checks, the crew was able to contact family members via a satellite phone before they were moved into a nearby medical tent for further health evaluations. After that, each crew member is expected to be placed in a separate helicopter and transported to the nearby city of Karaganda, Kazakhstan. There, Feustel and Arnold will part ways with Artemyev. The two NASA astronauts head back to the Johnson Space Center in Houston, while the cosmonaut will head back to Moscow. 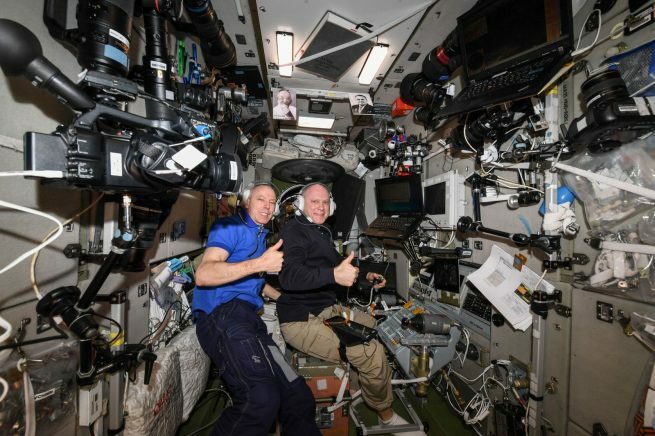 Back in space, the three-person Expedition 57 crew is expected to be joined in about a week by the two-person Soyuz MS-10 spacecraft with Russian cosmonaut Aleksey Ovchinin and NASA astronaut Nick Hague. Liftoff is scheduled for 4:40 a.m. EDT (08:40 GMT) Oct. 11, 2018.